When we arrived, we were the only ones there. Funny, I thought, since the place received quite a lot of press in the newspapers and blogs. Maybe nobody reads them anymore? Anyway, we sat down in the Coca-Cola colored chairs and tables in the Coca-Cola themed room filled with Coca-Cola paraphernalia with a television set playing a seemingly endless Coca-Cola commercials from all around the world. Perhaps the only thing not Coca-Cola in the place was the music. And the food? Mostly Coca-Cola product infused, of course. Another reason we wanted to try the place out. 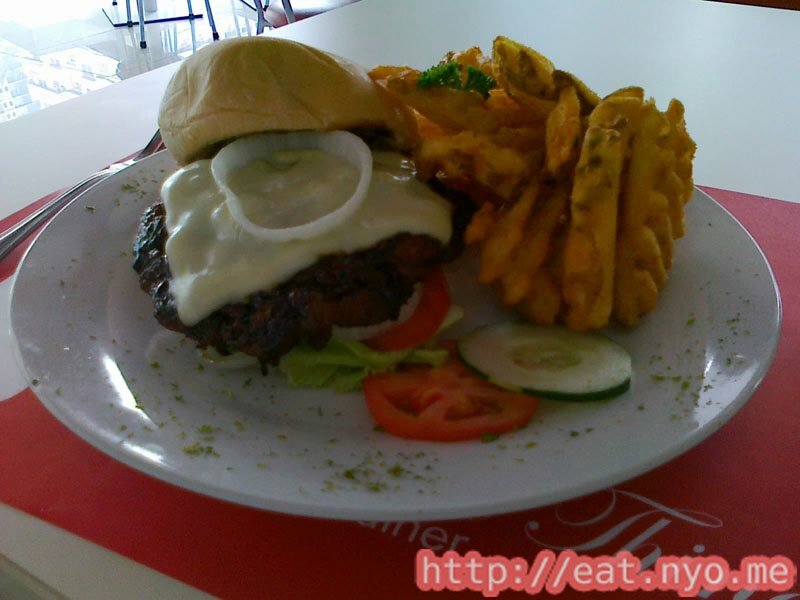 To play it safe, I had their Coca-Cola BBQ Burger (249 Php), because Coca-Cola sounds safe in a barbecue sauce. This comes with my choice of potato wedges and criss-cut fries. I chose the latter. 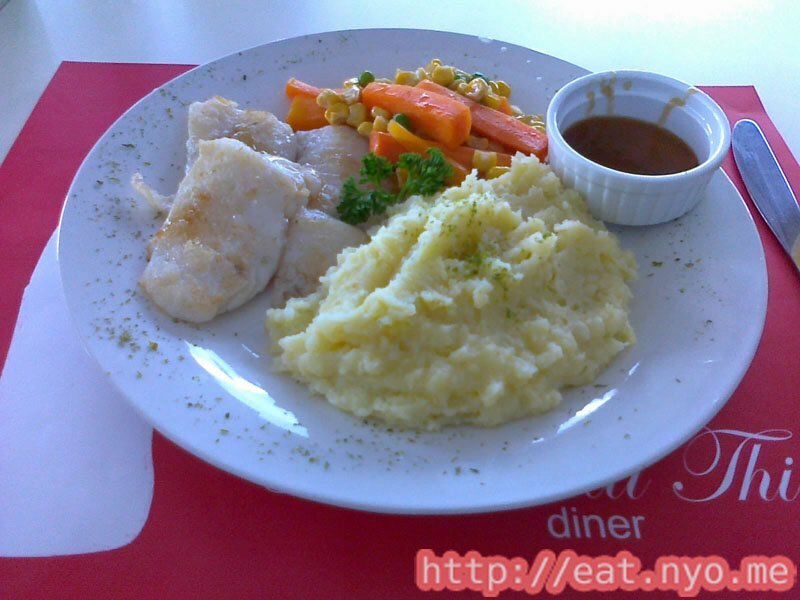 Beloved had something a bit more daring, Eight O’Clock Apple Green Tea Dory (249 Php). This one comes with a side of veggies and another side of her choice. She had their mashed potatoes. Because we didn’t want to waste the opportunity, and because Beloved didn’t have dinner the night before and this was our first meal of the day, we also asked for their Coca-Cola Seafood Jambalaya (229 Php). No sides this time. Our drinks probably don’t deserve any particular mention, but I do like to share that they serve Coca-Cola products mixed with coffee, milk, or eggnog. The Coca-Cola BBQ Burger looked pretty normal. There’s visibly a thick barbecue sauce under the bed of cheese. Because I know what’s in the sauce, I dug in the fries first, which, to my surprise, was actually very good. It’s crispy on the outside and fluffy on the inside. It was a pretty generous serving as well. After a couple of moments of hesitation and a few more minutes of wait for Beloved’s plate, I finally dig in to my burger. I found this bite quite surprising as well, this time for being pretty normal. Maybe I’m not a very avid Coca-Cola drinker, but I can’t really taste the Coke in the sauce. It just tasted like your usual sweet and tangy barbecue sauce. All in all, it was a pretty normal barbecue burger with a slightly heavier tag but with awesome fries for a side. Now, the quantity on Beloved’s Eight O’Clock Apple Green Tea Dory plate looked like a much better deal than my burger. After tasting it, it really does confirm the better value. The fish and veggies were steamed to healthy goodness, and the potatoes looked pretty healthy too. The fish was fresh and flaky, and the sauce included really did taste like apple. Together, it was weird at first, but the succeeding bites slowly merges into harmony. The sides were something to write home about as well. Beloved loved the mashed potatoes, and the veggies were very soft and tender. A simple but delicious plate overall. Our perhaps most dangerous plate arrived after we finished our first ones. The Coca-Cola Seafood Jambalaya indeed looked like it had Coke in it. It wasn’t your usual orange jambalaya—it had a hint of black—and I doubt it’s because of squid ink. 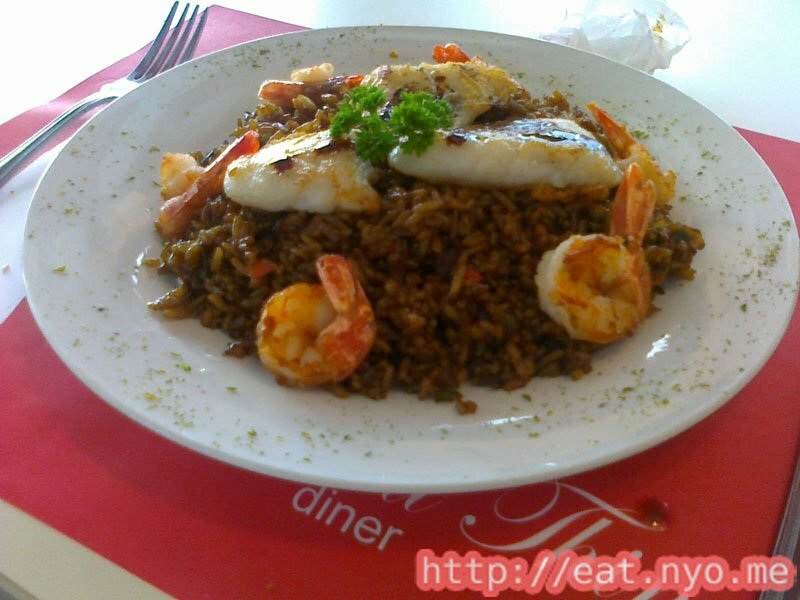 Aside from the obvious orange-black bed of rice, it had shrimp and dory on top. Yeah, it’s not really the most bountiful of seafood, but I thought it was an okay serving. Indeed, the rice tasted unlike your usual spicy jambalaya. While it did still have the spice, it had a distinct sweetness from the Coke. I was also very pleased to find bits of bacon buried in it. The seafood on top makes this plate complete. The dory was basically the same as the fresh, delicious one on Beloved’s plate minus the apple sauce. The shrimps were charred to my liking, although Beloved didn’t really like it being as dry as it was. I found this plate the best one we had that day. Overall verdict? Well, I wasn’t really sated by my safe order. Beloved was satisfied with hers. Our last shared plate exceeded our expectations. The best part is it’s the cheapest one we ordered. I guess for an adventurous place like The Real Thing Diner, you should also go for the more daring items on the menu, such as the Coca-Cola Jambalaya. I can’t really speak for Coca-Cola lovers because I’m not really one myself. But if you like trying out something new, this place might be for you. Not recommended for: Pepsi lovers. Smart nomnomnom tip: Try the more adventurous-looking plates.